MMA star Conor McGregor has avoided jail and a criminal record after pleading guilty to disorderly conduct at a UFC event in New York earlier this year. He could now be set to return to fighting as early as this year, with his manager Audi Attar saying that McGregor “would like to fight” this year and that talks are resuming with the UFC. McGregor (30) had been charged with a number of offences including a felony charge of criminal mischief and a misdemeanor charge of assault. 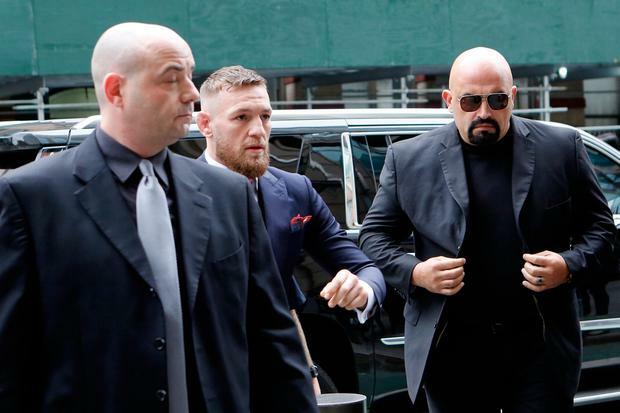 However, at Brooklyn criminal court today, the District Attorney stated that a plea deal had been reached which resulted in felony charges against McGregor and his co-accused, fellow MMA fighter Cian Cowley (25), being reduced to disorderly conduct. It means that both men have escaped a criminal conviction, as the charge is deemed a violation under New York state law. As part of the plea deal, Conor McGregor must undergo five days of community service which will be carried out in New York, as well as between one and three anger management classes. Three orders of protection were also issued against McGregor. The court ruled that he can not come into contact with, either by himself or through a third party, – UFC fighters Raymond Borg and Michael Chiesa as well as Jason Leadbetter until July 25, 2020. Cian Cowley has been ordered to carry out three days community service, between one and three anger management classes as well to obey a protection order. McGregor was also ordered by Judge Raymond Rodriguez to pay restitution for the damage caused to a bus during the melee at the Barclays Centre. Both men walked free from court pleading guilty to disorderly conduct, and agreeing a conditional discharge that they keep the peace for a year. McGregor’s lawyer Bruce Mafeo said that the outcome of the court case will have no impact on his client’s immigration status, and that the community service will be decided by the office of the district attorney. “This is the same outcome that would have occurred if he had been a non-celebrity. The DA’s office thought through this very carefully. We appreciate the district attorney’s office treating this as any other case,” Mr Mafeo said. While Conor McGregor did not respond to any questions after his statement, his management team spoke to reporters outside of the Brooklyn courthouse. His manager, Audi Attar, told Independent.ie that the incident at the Barclays Centre was not a publicity stunt, but simply a “mistake” by the 30-year-old. “I think people think everything Conor McGregor does is somehow staged. At the end of the day, it was a mistake, he dealt with it, faced it head on and now we got to move on and learn from this incident,” Mr Attar said. He also addressed controversy surrounding a picture McGregor took with Russian president Vladimir Putin when he attended the World Cup final in Moscow earlier this month. In a social media post alongside a picture of McGregor and Putin, the UFC star described the Russian President as “one of the greatest leaders” of the modern era. “He was going to the World Cup Final, I think the way the media spun it out to be some type of a political visit is out of context,” Mr Attar said. He added that he could not comment on whether the UFC will take any internal action against McGregor over the Barclays Centre melee, which happened at a UFC media event.